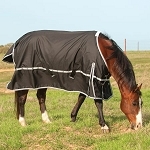 Size 66" 69" 72 75" 78" 81" 84" 87"
Unique barrier technology has a 1000D polypropylene outer which protects the waterproof and breathable barrier layer underneath. Polypropylene is a stronger alternative to the widely used polyester turnout material. 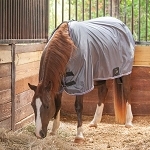 Comes with anti-static, anti-bacterial polyester lining and thermobonded fiber filling. The Polypropylene is a thermoplastic polymer, used in a wide variety of applications, including food packaging, textiles, plastic parts and reusable containers of various types, laboratory equipment, loudspeakers, automotive components, and polymer banknotes. 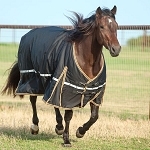 Polypropylene fabric does not retain moisture, which makes it a popular choice for the outer shell of turnout blankets/rugs. It is also used for binding or webbing. Worth noting: Polypropylene fabrics has a relatively low melting point, so you'll want to avoid putting it in the dryer.